I will learn squirrel myself after I finish my schools, so for now I'm looking if there's any function that skips and repeat/autostart custom sounds. EDIT: Same I need a function which stops current sound and a function which only allows players to run one sound at a time. 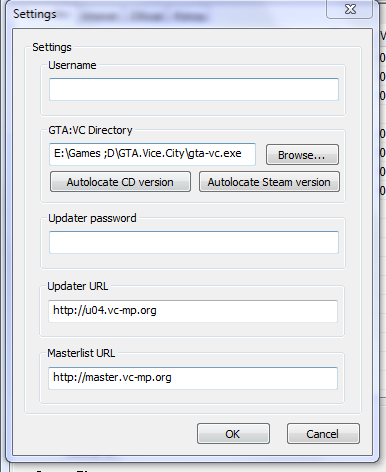 Snippet Showroom / Re: GTA Vice-City: Cheats. ysc3839's VC:MP Launcher / Re: My IRC channel #YSC on LUNet! solved by; running as administrator. is its okay? I've entered server and quit it -> clicked History tab and browser crashed. Plus my settings and history were reset after re-launching the browser. Btw, I loved this browser, hoping for fixes. Hello as we all know, we've option of 'Stats' in menu where (in sp) we can see our stats (i.e Unique Stunts, Innocents Killed, Good Civ bonuses etcetera....) As in the last update of VCMP developers added new feature where we're able to edit 'Hyman Memorial Stadium Banner' so I think it's not impossible for them to add new feature where we will be able to edit the Stats with our own style, for example; (rn) In VC-MP it shows same as SP with 0 everything, but what if we could edit it (where players can see their Kills, Deaths, Ratio depending upon server owners and scripters how they want the look). My english is bad, but understandable, my point is make the stats option editable. If I've posted in wrong board then it should be moved to correct one, and I apologize for your time. Nice, which server is this? Btw , Can I know how you converted it?